If you’re coming in soon to discuss your tax return for yourself or your business with one of our accountants, then you want to be fully prepared by not arriving completely empty handed, or at least be prepared with some records or have easy access to them. 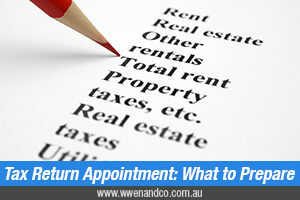 Here is a brief, general checklist to help you prepare for your tax return appointment. Not all of the items will be relevant for everyone; what you need will depend on your own circumstances. Bank statements for any interest earned during the financial year. Capital gains – for example, sale of shares or property. Rental income – for example, from an investment property. Motor vehicle expenses based on business use percentage and kilometres travelled (include your logbook if applicable). Travel and accommodation information – domestic and overseas. Work uniforms and other clothing expenses. Interest paid – say on an investment property. Low value pool deductions / depreciation. Utilities – electricity, gas, water. Details of any asset purchases. NOTE: We highly recommend that you keep receipts for all expenses and tax deductions you are claiming for your business. Scan and file them electronically so that they are accessible should you need them for audit purposes. Bank and credit card statements. Lease, hire purchase, chattel mortgage or other loan agreements to your business. Business Activity Statements and Instalment Activity Statements and working papers. Stock valuation figures after performing your June 30 stocktake. We will work through every allowable tax deduction available for you and / or your business. Don’t forget to ask us what tax incentives are available to you as these may work to increase your tax deductions.